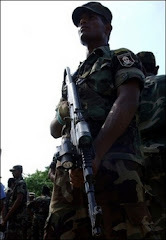 Sri Lanka Defense spokesman Minister Keheliya Rambukwella said that the Netherlands based ZOA; a non-governmental organization registered for refugee care was suspected of running a hospital at a Tamil Tiger insurgent garrison overrun by the country’s elite police commandos, the Special Task Force (STF) recently. ZOA Refugee Care is an international and Protestant agency, based in the Netherlands, and focuses on relief and rehabilitation among refugees and IDPs. In the beginning ZOA worked in countries in South East Asia. ZOA is the abbreviation in Dutch for Zuid (South) Oost (East) Azie (Asia), the part of the world where ZOA started her work in the seventies. The Minister said, "We found an NGO fully and totally involved in running a hospital at Stanley Base. It is ZOA." Stanley Base, one of the largest Liberation Tigers of Tamil Eelam (LTTE) garrisons in the Eastern Province jungles of Ampara, was overrun by the STF recently and the Defense sources revealed that a NGO who are supposed to care for civilians were actually running a hospital for the guerillas inside the garrison where no civilians were allowed to enter. But ZOA has announced that the equipment found in the Tiger hospital might have been stolen from their closed down office. Immediately after the LTTE’s Stanley camp, named after its commander, was abandoned by the Tamil Tigers, the STF said they were amazed to discover the hospital run by the Dutch NGO. If the NGO is found guilty after a full investigation ZOA will be ordered to leave the country, Rambukwella said. Rambukwella said certain other groups are also under investigation for helping the LTTE insurgency. But he did not name them. "Once investigations are over and we have 100 percent confirmation of what we suspect ... we will have to take steps to have their visas revoked or order them to leave," Rambukwella further said, referring to ZOA. "We ... closed our office because of fighting and had to leave so many things behind which we couldn't carry with us," he added. "Certain things they say were found in that LTTE (Tiger) hospital is things we presume were taken from our office." In a second incident January 11, the STF commandos overran another Tiger camp at Kanjikudichchi Aru named Janak in Ampara and found two boats donated by Save the Children and two tents emblazoned with the UN refugee agency UNHCR's logo, officials said. But defense officials were of the opinion that, in this case, the aid had been stolen from civilians it was donated to by the LTTE.